Back in September, researchers in the UK discovered that brain disorders such as Alzheimer’s may be transmissible through certain medical procedures. Skeptical scientists urged caution, but now a different set of autopsy results have shown the same thing. Five of the seven brains analyzed also showed signs of Alzheimer’s disease. 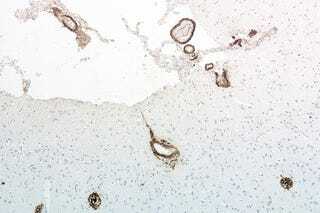 This was odd because the individuals, age 28 to 63, were too young to have developed the amayoid plaques indicative of the neurological disorder (amyloid plaques are a misfolded protein that fuels the spread of Alzheimer’s). Analysis of a control group failed to show signs of this wasting signature. This suggests that that the “seeds” of certain neurological diseases can be transmitted during certain medical procedures—or even through contaminated surgical instruments. The new report, written by researchers from Switzerland and Austria, can now be found in Swiss Medical Weekly.